Days after two massive explosions rocked Tianjin, China, leaving hundreds dead and even more wounded, a tiny puppy has emerged unscathed. It is not know if the puppy was well hidden from the blast or wandered in later. The pup is now being called Shenghua which translates to Biochemistry in English. 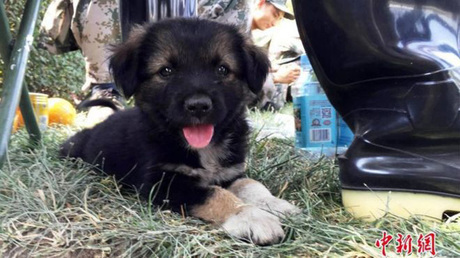 Shenghua was found by a group of soldiers, and seemingly grateful, has not left their side. The image of the pup has been plastered to social media since and lifted the spirits of many by becoming a symbol of hope.